Now that you have all your pieces cut out, first stitch your main exterior panels right sides together. 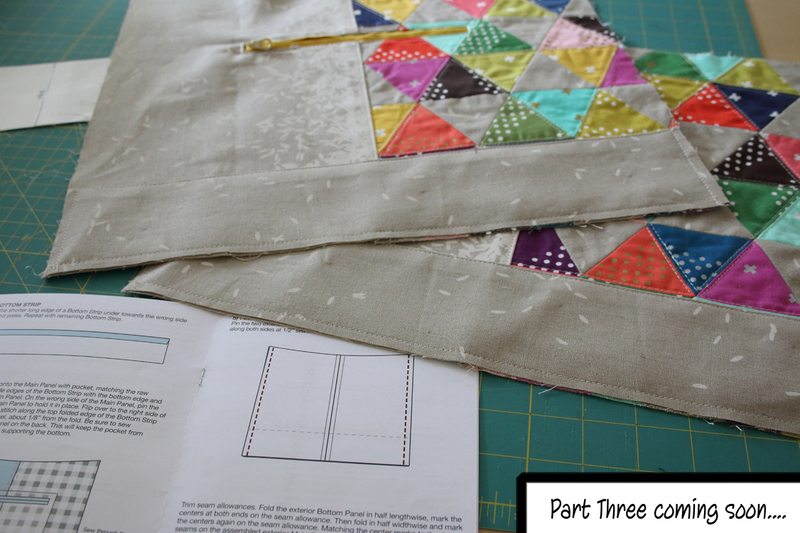 You will stitch one Main Exterior piece to one Basic Exterior piece as directed in the pattern. Press this seam open. Repeat for the other panels so you have two Main Exterior Panels. 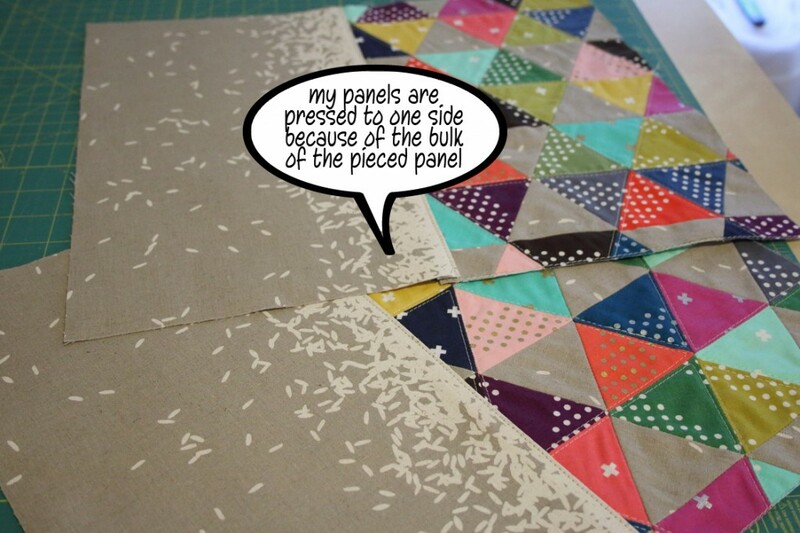 I had to press my seam to one side because of the bulk created by the pieced Main Exterior panel. For this reason, I topstitched along one edge of the seam only. 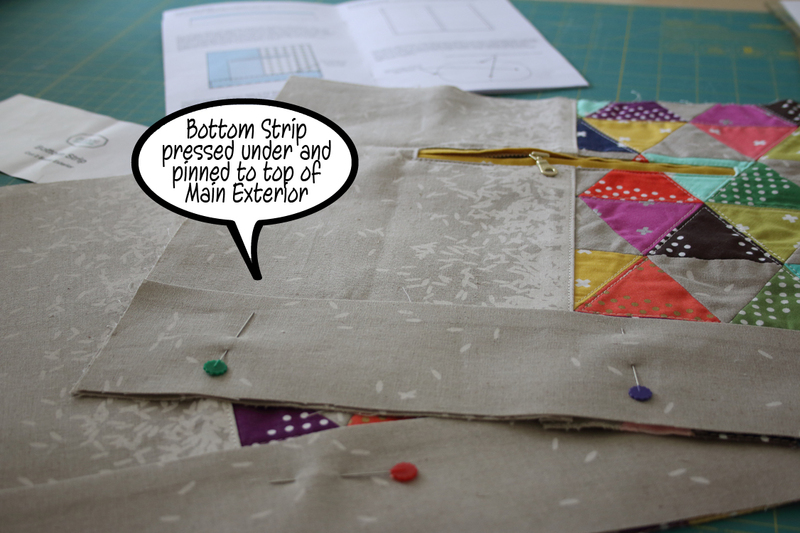 You may choose to topstitch both sides of the seam for a more secure seam. 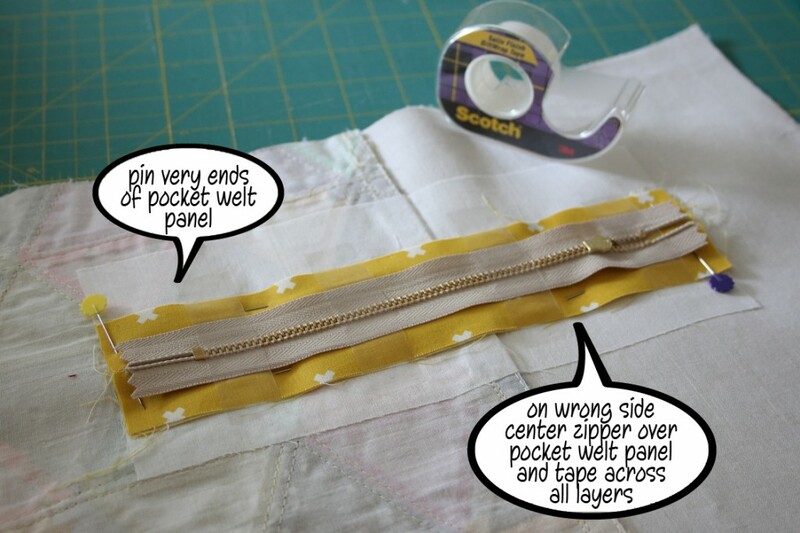 Measure and mark the exterior zipper pocket hole on the wrong side of one Main Exterior panel. Be sure to first mark the center of the panel to start your measurements from. 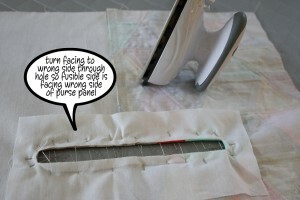 Pin your fusible facing (SF101) to the right side of the Main Exterior panel with the fusible side away from the right side of the Main Exterior panel. 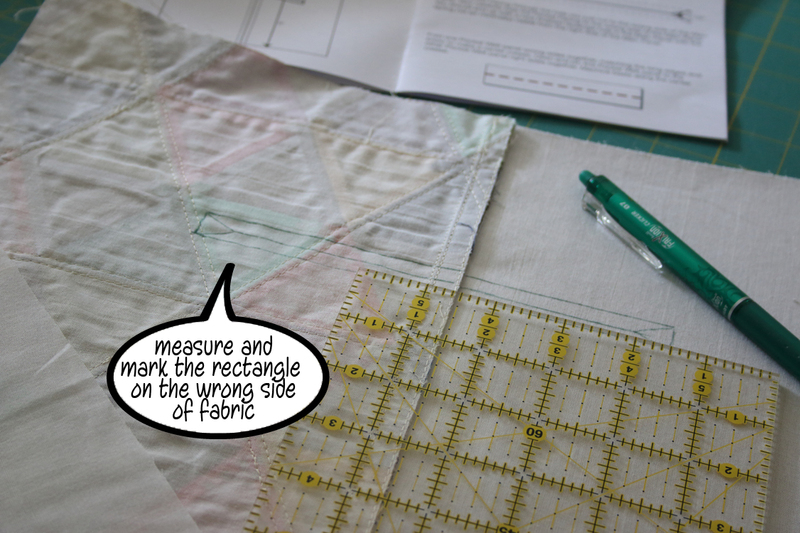 From the wrong side of the Main Exterior Panel, stitch along the marked line. 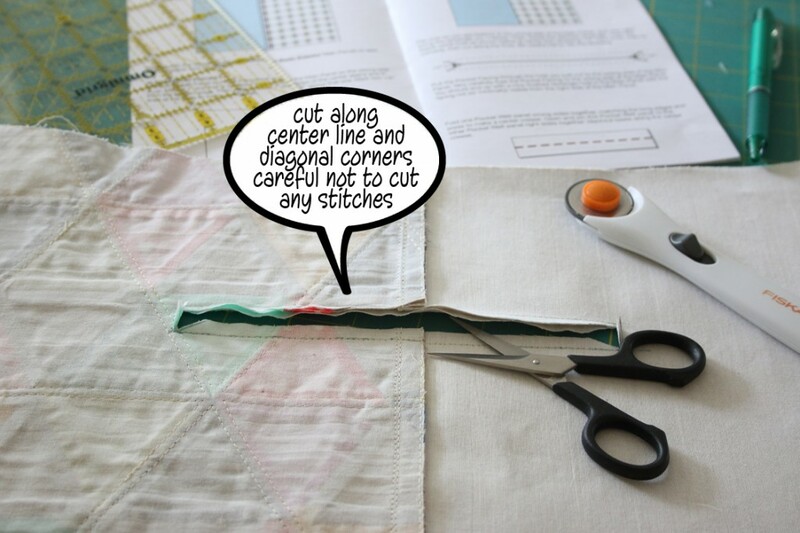 Then, cut along the marked center line and diagonal lines. I like to use a small rotary cutter and ruler to cut the center straight line, then using small sharp scissors I cut the diagonal lines. Turn the facing to the wrong side and press the pocket hole open. I use pins that can be ironed to hold my facing in place while pressing. Remember, the fusible side of the facing will now be to the wrong side of the Main Exterior panel, so once you press the layers they will hold in place and be difficult to remove. 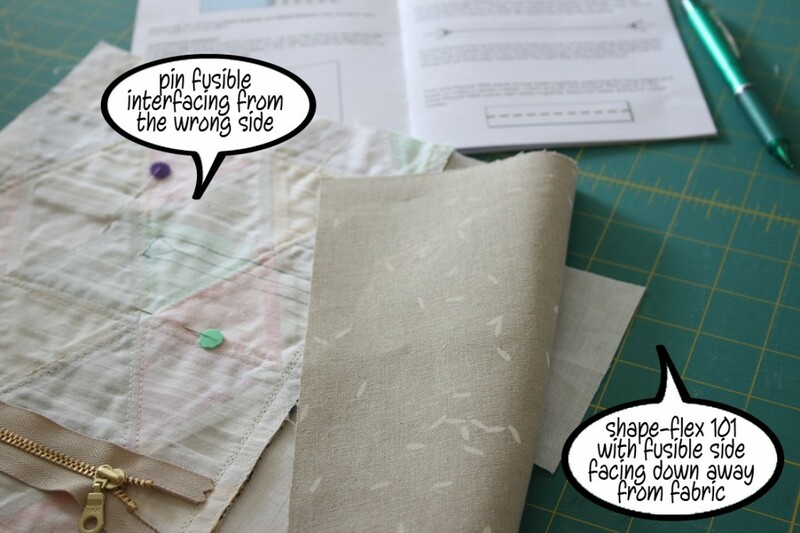 The directions in the pattern are great for assembling the zipped welt pocket. The directions I have here are slightly different because I use Scotch Tape to hold my zipper in place. 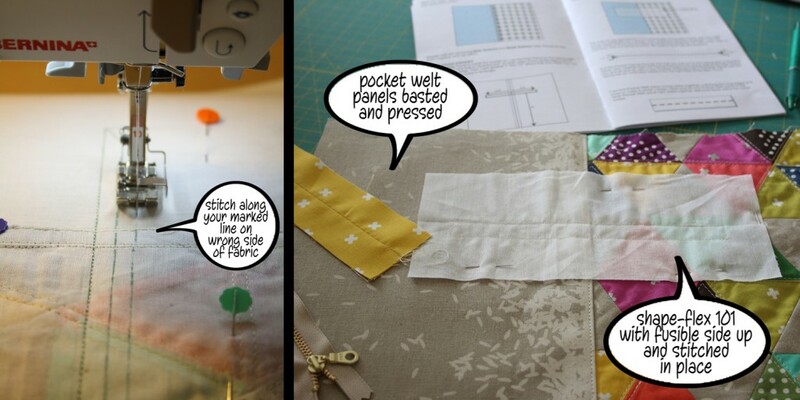 Please follow the directions in the pattern if you prefer not to use the tape method. 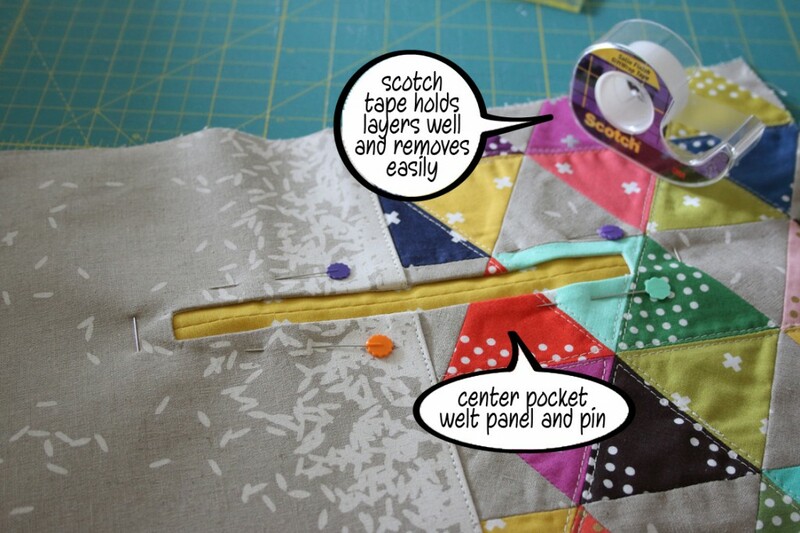 I was taught years ago by my seamstress Grandmother to use Scotch Tape when sewing zippers. Pinning has a tendency to distort the final stitching and the pins can prevent you from getting close to the zipper for good stitches. 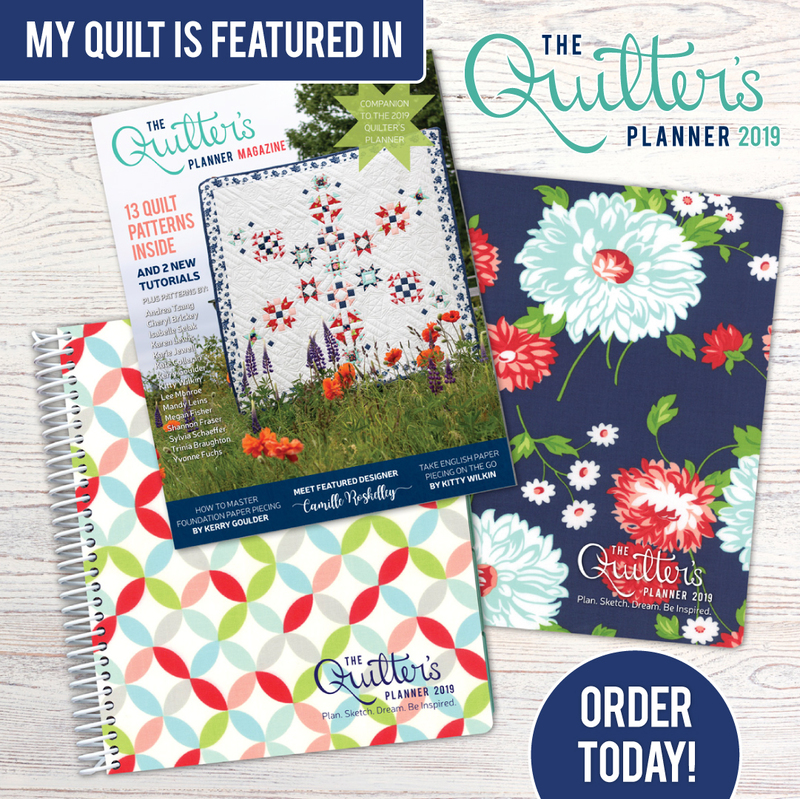 Scotch Tape has the perfect amount of adhesive and when stitched has a beautiful perforation that makes it so easy to remove from the backing with no remnants of tape left. 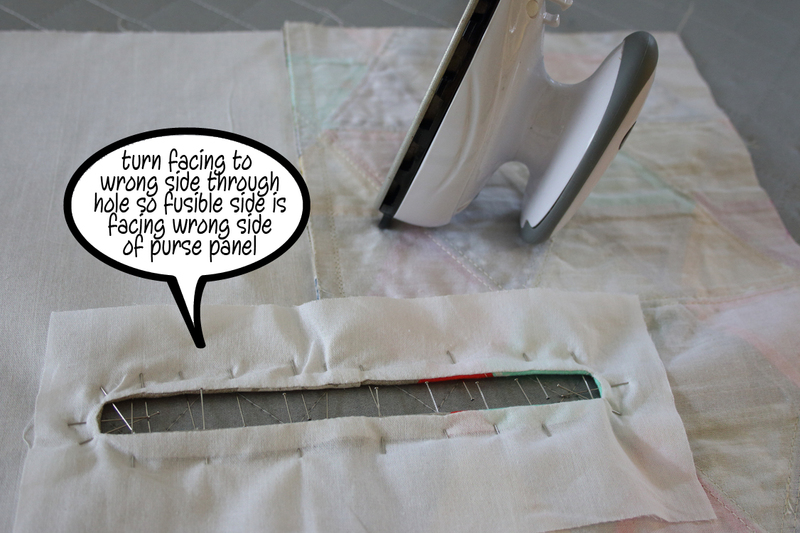 sure the metal ends do not align with the edge of the pocket hole where you will be stitching. 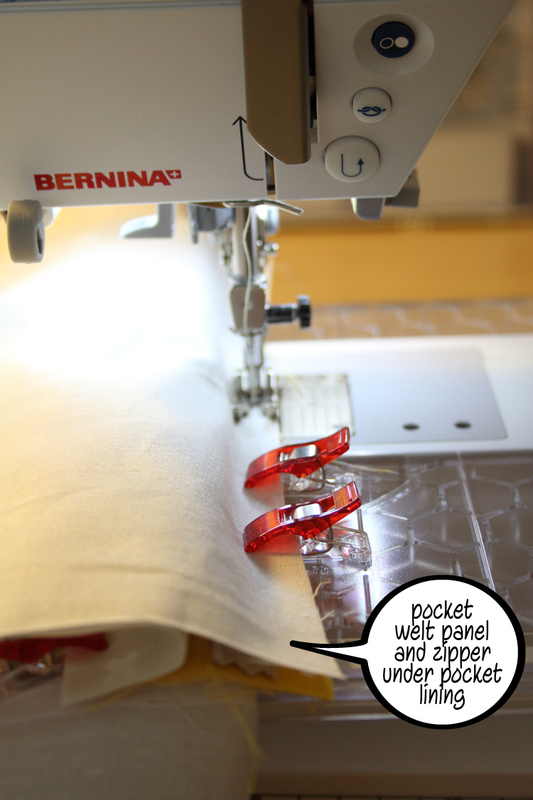 Also make sure your zipper is facing away from you and toward the pocket welt panel. Place tape over all layers being sure to cross the zipper and pocket welt panel. Pin the very outer ends of the pocket welt panel. 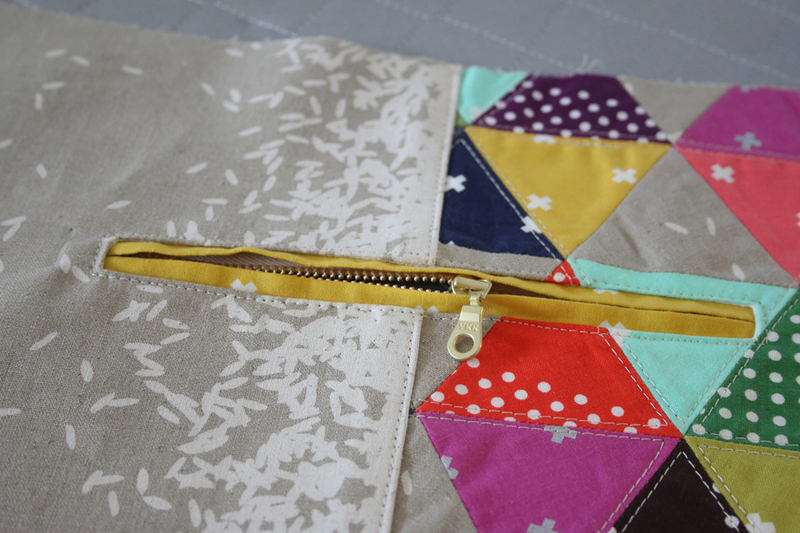 Flip over to the right side of the Main Exterior panel and topstitch along the edge of the pocket hole. 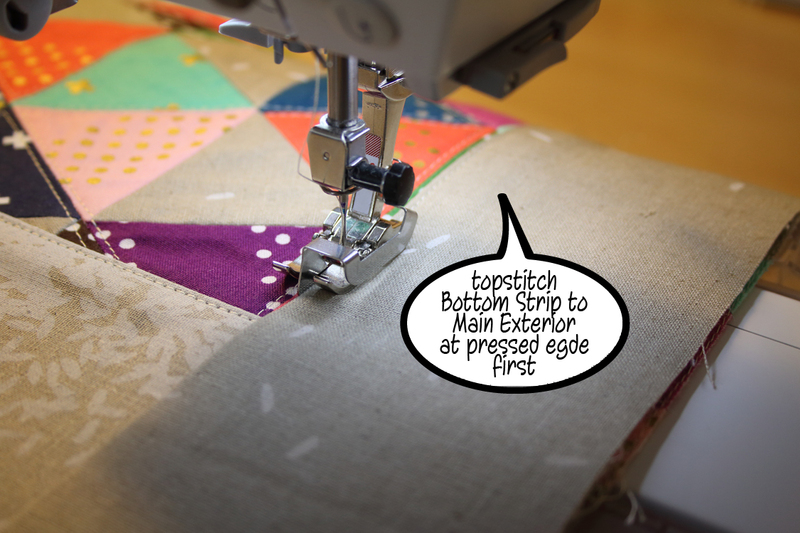 I like to increase my stitch length to 3 or 3.5 when topstitching. 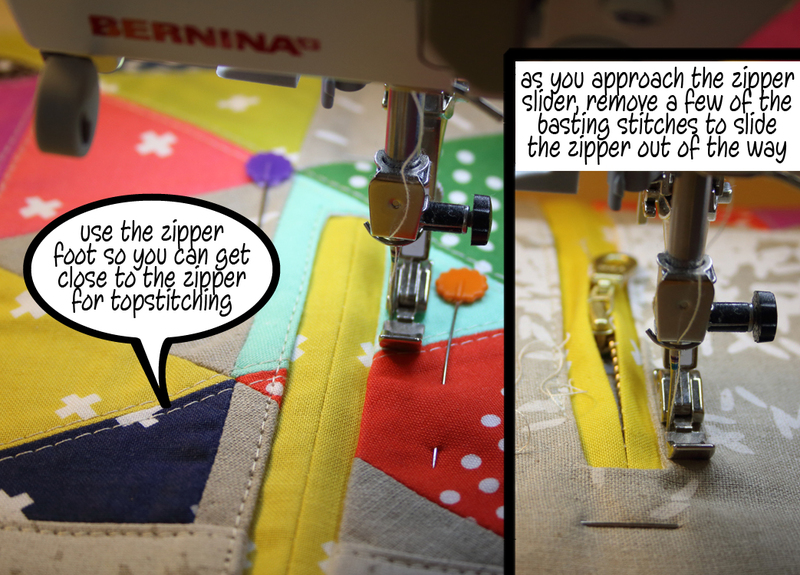 Using a zipper foot allows me to get close to the zipper without distorting my stitches as I go around the pocket opening. I start my stitching on one side and go around the first two corners. As I approach the bulk of the zipper slider, I stop my needle in the down position and remove a few of the basting stitches in the pocket welt panel in order to slide the zipper behind the zipper foot so I can continue around the last two corners and finish the topstitching. Remove the remaining basting stitches in the pocket welt panel. Voila!! You have a double welt zipper pocket! Stitch the pocket lining to the top and bottom of the pocket welt panel. Be sure you are stitching the pocket lining to the pocket welt panel and not the Main Exterior panel. Press the pocket lining starting from the top. Stitch up the sides of the pocket lining, folding the Main Exterior out of the way to access the pocket lining. 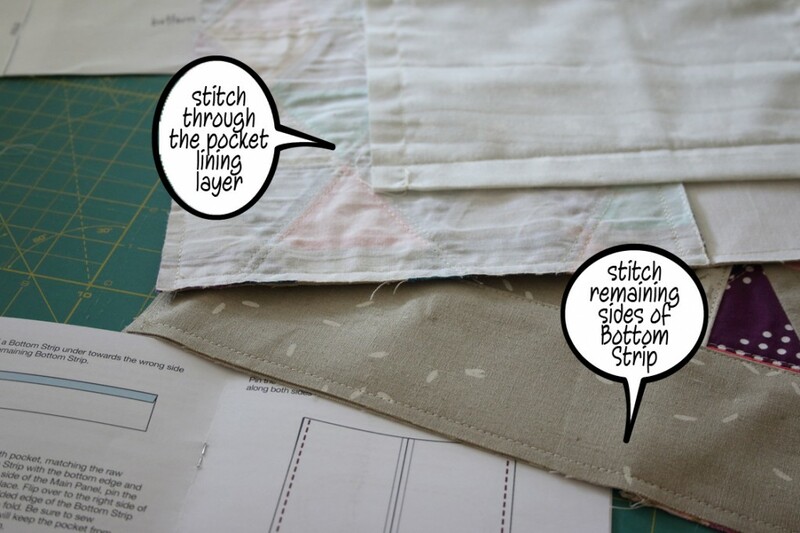 Fold over and press ½ inch of the top of the Bottom Strip. Line up the Bottom Strip with the bottom portion of the Main Exterior Panel, matching the raw edges of the Bottom Strip with the raw edges of the Main Exterior Panel. Pin the Bottom Strip in place. ….and then baste the remaining edges to the Main Exterior Panel within a ¼ inch of the edge. Repeat for the other Main Exterior Panel. 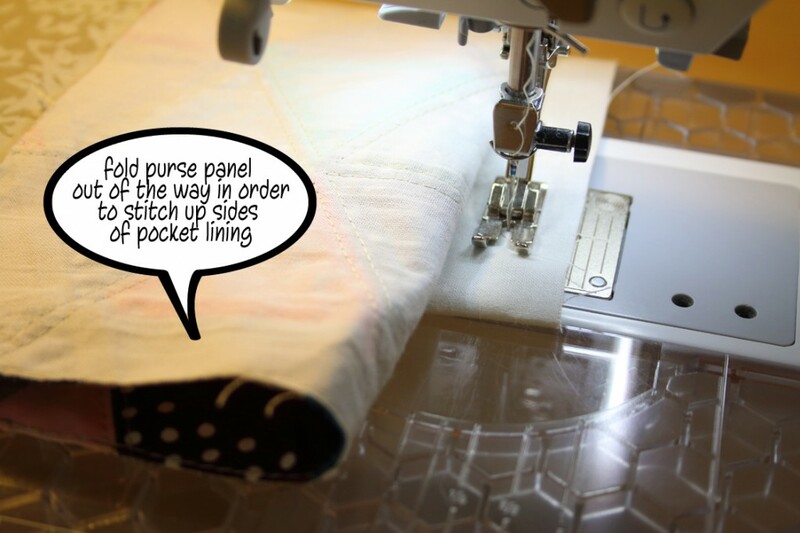 You will stitch through the pocket lining on one of the panels. You have two Main Exterior Panels ready for bag assembly. Don’t forget to tag your bags with #oahumqg , #omqgBonnieBucket, #omqgsewalong, #swoonpatterns, and @oahumqg . Looking forward to seeing everyone’s progress! !